This amazing book is written for women by a woman. It is a herbal guide to taking care of yourself. I love how the book is written in sections by basically age. The book uses herbs and everyone should start slowly as herbs are plants and some people can be allergic to certain ones. If you cram a whole bunch not your system at once and have a reaction to even just one you will not be sure which one. This book also tells you not to to leave your doctor out of the equation of tending to your health as well. I love that this book is using all natural herbs. With all the supplements out now days it is hard to choose ones that are all natural. This book will take the guess work out and you wont have to read as many labels. You can grow a lot of these cures in a kitchen window or even in your back yard and know for sure that they are all natural. 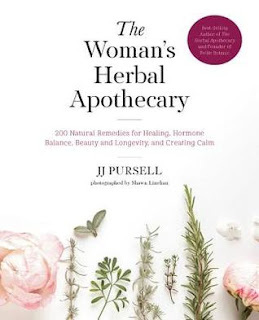 There are 200 natural remedies in this books for all kinds of woman's ailments. It is well worth the time it takes to read and it is also a great reference book to keep on hand.